I love the post office, and especially post offices with character, with a story of their own. 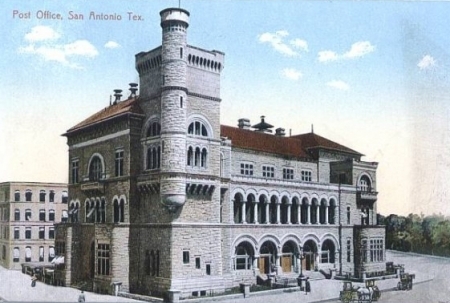 I remember the first time I saw the old San Antonio post office, a castle in Texas, how I marveled at its unlikely beauty and how I was saddened to learn it had gone the way of the dodo. I read and learned that many of these castles were built because 1) the post office was often the only federal presence in a city, and the government wanted to make a statement, 2) legislators wanted to spend heavily in their home district, 3) such buildings were a way to build their architect’s reputation. Sadly, most postal castles were eventually torn down and replaced with modern boxes that radiated power and practicality. But we have the memories. At the other end of the spectrum are those post offices that tell us the mail reaches everyone regardless of the humble size or nature of its dwellings along the way. In every case, post office postcards have a richly satisfying postal cachet: a card about the post, sent through the post. These are here for your enjoyment. Is there a chance I can get a 300 dpi tiff of the Odessa and Vladivostok, Russia post cards. I would like to use them in an article and will give you and your website credit. Thomas, I can’t find those in my collection; I must have parted with them at some point, so the Web jpg is the best I can do. I have seen both appear on eBay from time to time. This is one of the coolest, most interesting blogs I’ve stumbled upon in quite a bit. Thank you so much for making this! I found you by the way googling Tampa Post Office Building. Trying to figure out if the post office that is on this linen 1950s postcard I have, still exists or not. I have an actual post card of US Post Office Bill’s Place Pa. Population: 5, the one with the Postmaster standing in front with his hand on the side of the building: I found in my Grandsmother’s old family album which is very dated to say the least. My grandmother and grandfather were born in Berkley, WVa. so I am guessing they must have visited the town of Breezewood for some reason and picked this postcard up as a souvenior. It is in very good condition, back has no writing on it and the edges are in good shape as well. Is there a value ot these old post cards? Curious. By the way this is a awesome site. thanks! I really loved your blog. Post Offices have always been a kind of second home to me as my father worked at Simla Post Office. Good work indeed!! 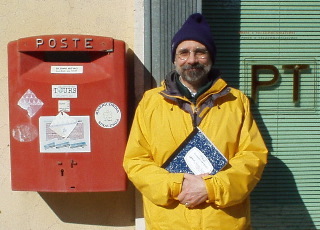 Are you allowing me to use a few images in a book dealing with postal service and postal transport? The source is listed with the image. Forward looking for your answer, already thanks.